Tomato-mozzarella salad is a dish were mozzarella is commonly used. Appetizers made of carrots, mozzarella and black olives, styled to look like penguins. 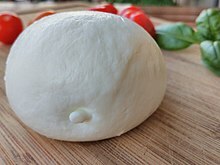 Mozzarella is a kind of fresh cheese. Originally, it was Italian but now it can be found all over the world. Its made of the milk of cows or of water buffalos. A cheese produced in a similar way, but with sheep's milk is common in Sardinia, Abruzzo and Lazio. It is sometimes called mozzapecora. Mozarella of goats' milk can also be found. Its development is more recent, though. The main reason it is produced is that goats' milk is easier to digest than that of cows or buffalos. Mozzarella is common in Italian cuisine. It is used on Pizza, but other recipes exist as well (for example, with sliced tomatoes and a little vinegar). Mozarella can be kept in the fridge for a few days, if its covered in brine. This page was last changed on 20 May 2018, at 13:33.